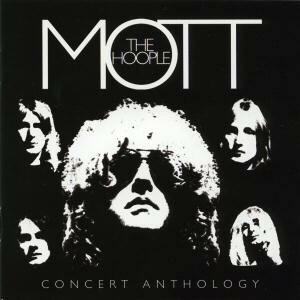 Mott The Hoople CD: "Concert Anthology"
An odd one, this. Yet another sampler taken from the All The Way... and ...Live Heaven releases but with (on the face of it) a strong track selection. A full tilt rocker, Thunderbuck Ram, starts things off nicely, but then everything goes awry as Ian introduces Keep A Knockin, only for The Original Mixed Up Kid to be heard. Further confusion follows, as Ian introduces Walkin' With a Mountain (he also introduces it at the end of Whisky Women - and neither version is on here!) only for Laugh At Me (a slower number) to be heard. No, Ian isn't off his rocker, these introductions reflect the original concert running order, but whoever put this compilation together wasn't paying attention to detail. These faults pervade the disk and can cause confusion for the listener unfamiliar with Mott's music and making it appear tracks are somehow missing. Leaving these points to one side, this is actually a good selection of tracks. For once, the sleeve notes are good as well, written by MTHAS editor Keith Smith and accompanied by several live and studio photos. The casual fan thus gets a good introduction into who Mott were and what they were about. So, in summary a good track selection and excellent sleeve notes, let down by clumsy editing. Recommended.